"Yes, Jim, she is an RF, but not as we know them," as ‘Startrek’s’ Mr Spock might say. 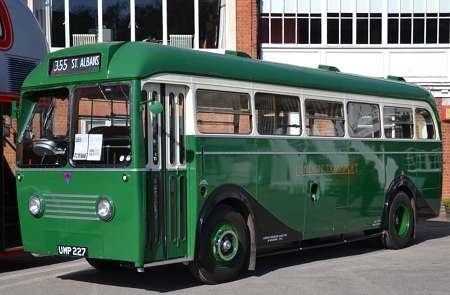 This AEC Regal IV of the normal RF specification has a Metropolitan Cammell B35F body and is seen in the livery of a later owner, Hampson’s of Oswestry, at Dunsfold on 10 April 2011, another of the rare occasions when ‘Wisley’ wasn’t at Wisley, before moving to Brooklands. Pete, I wouldn’t regard this as being a "normal" RF. This was one of 25 "Private Hire" RFs, the major differences between this and the standard RF being a length of 27’6" to the 30’0" length of the Standard RF and glazing in the roof. I always thought these stubby creatures looked somewhat unbalanced, compared with their grown-up cousins! Here are two in service with London Transport LUC 208 RF8 and LUC 225 RF25. OOPS! Sorry, folks, but I hadn’t realised that, apart from the roof glazing, the dimensions of these vehicles were any different. I had always thought they were of normal length but with more legroom for the sightseeing public. There is a view of an RFW somewhere in the queue, another factoer in my description of ‘normal’ specification! 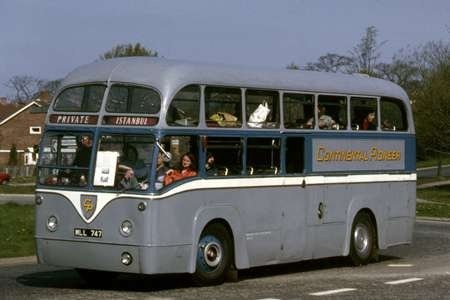 At 27’6" long and 7′ 6" wide with only 35 seats and an unladen weight around eight tons (about the same as a 53-seat Leopard) these were not in high demand when withdrawn in the early 1960s, however two other firms who took to them Garelochhead Coach Service and Premier Travel, both of whom had narrow roads to serve. Both Mr Lainson and Mr Foy were also known to drive hard bargains. 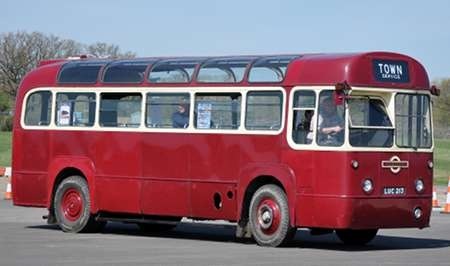 LUC 213 survives in preservation with Wealdsman Preservation Group, Headcorn they are also listed as having LUC 212 & 216. Other survivors of the ‘Lucys’ as they were nicknamed are LUC 204, 210, & 219. 220 is also listed as a spares donor with Penfold of Meldreth, Cambs but may have been broken up by now since he sold LUC 204 to Dawes of Headcorn circa 2013. 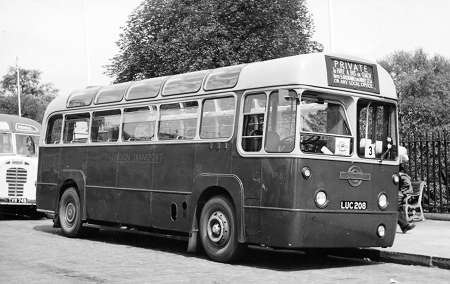 Premier Travel of Cambridge bought& operated 8 of the LUC’s from LT in 1964 they were LUC 202/3/4, 206/7/8/9 & 211. 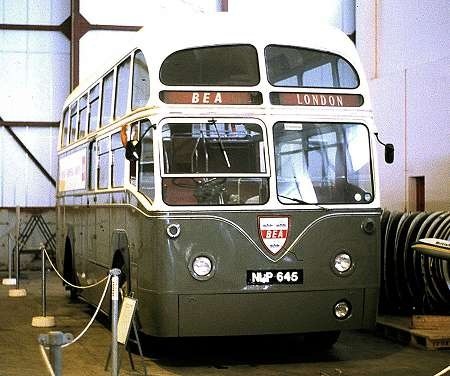 The Garelochhead ones (courtesy Andrew Shirley’s GCS Bromley Garage website) were LUC214,215 and 224 numbered 39-41. These private hire RFs were ordered before the legal maximum length was increased in 1950 to 30 feet. When the new limit became effective, it was too late to change the dimensions of the first twenty-five machines then under construction, and these, together with the Park Royal prototype UMP 227, became the only short wheelbase 27ft 6ins long Regal IVs ever produced. LTE quickly amended the specification for the subsequent six hundred and seventy-five RF deliveries. The short RFs were all withdrawn by LT during 1963, whereas the thirty footers ran on reliably for upwards of ten more years. 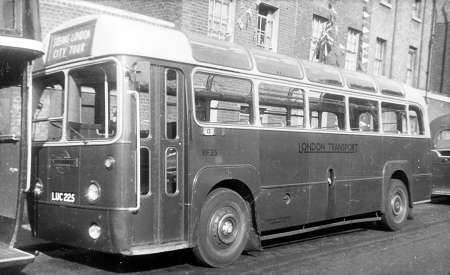 The registration letters ‘LUC’ were carried by many members of the RFW, RT and RTL classes as well as the short RFs, and the name ‘Lucy’ was never applied in London service. Roger, I am quite relieved by your confirmation that "Lucy" was never used by LT staff. As a member of LT’s Bus schedules office at 55 Broadway in the late 1960’s and early 70’s I was surrounded by any number of feral bus enthusiasts and I’m sure that if that expression had been used I would have heard of it. The reason for their withdrawal in 1963 was a dire shortage of drivers at that time and the consequent need to concentrate manpower/overtime on keeping normal services going, causing LTE to abandon private hire work. David, I was a schedules compiler at Reigate at about the same time. We can preen ourselves on our skills in producing efficient duty schedules within the very tight constraints of the T&GWU agreements then prevailing. As an expatriate Croydonian in East Anglia, I don’t know about the current situation in London, but the present day schedules of the provincial big groups, unfettered by such agreements, are kids’ play to compile, and often inefficient into the bargain. I have read that the last ten of these 27 foot 6 inch long vehicles were modified to Green Line standards receiving route board brackets and overhead luggage racks. Quite when this was done I don’t recall. This vehicle is now back on the road having been repainted in original livery and mechanicals serviced as part of the Quantock Heritage Fleet.